Heading out for a trip into the wilderness and roughing it with no power? Here’s how to plan carefully and install a reliable off-grid power set-up. The first step to setting up your caravan for an off-grid getaway is to figure out how much power you need. If you haven’t taken your caravan off grid before, it’s better to just take a short trip initially. This is because it is often a matter of trial and error before you can cater to your power needs perfectly, and you don’t want to be caught unprepared. To calculate how much power you’ll need, check how much energy your appliances use (in watt hours or ampere hours) and multiply it by how long you use them for on an average day. Add the values together, and you’ll have a pretty good idea of how much power you’ll need to supply to your caravan each day. There are plenty of power solutions available, each with their own advantages and drawbacks. You can pick just one if you decide it suits you best, or use a combination of sources. It’s really a matter of knowing what works best for you. Generators are generally the go-to option for powering a caravan off grid. And if you’re a luxury camper with a television, washing machine, fridge, air conditioner, or any other power-hungry appliances, then you’re going to need one. Solar power is a great solution for those who don’t have sizeable power needs, or as a complementary power source for those who do. They often can’t provide for all of the power needs in an average caravan, but solar power will do wonders to save your generator from running for too long and growing tired too quickly. There are plenty of benefits to solar power sources. They aren’t noisy, they give off no fumes, and they’re sustainable. Also, if they are well designed, they should work autonomously, and won’t need regular servicing, which makes them much cheaper to run. 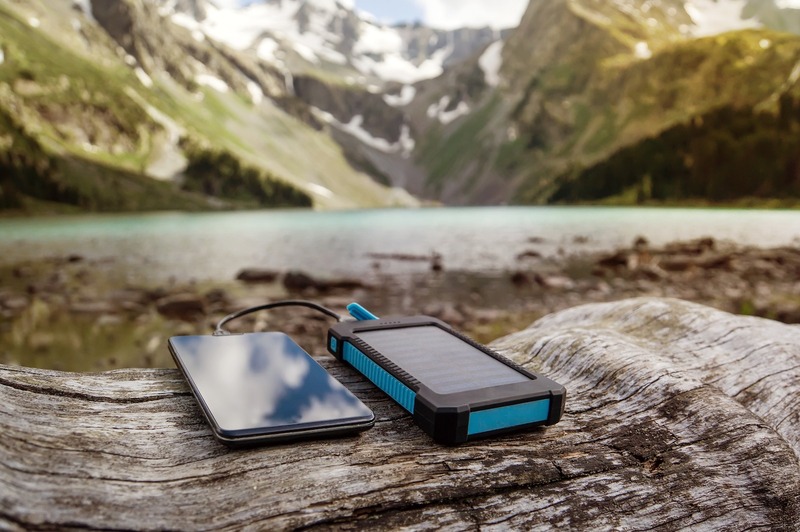 If you just want to power your smaller devices, consider using a solar maintenance charger. It’s a small, tablet-shaped solar panel that allows you to charge your phone and other small electronics – or even jumpstart your car. Picking the right battery pack to store your power is just as important as choosing your source. The key here is to look for models that have more than two or three days’ autonomy – or at least enough time for you to get back to a powered site again. There are different kinds of batteries that are better suited to certain purposes. Lead-acid batteries are good for supplying a moderate current consistently over time, but can’t handle very heavy loads. A lithium battery’s voltage won’t vary much under a heavy load and charges quickly, but they are relatively expensive. One of the most popular solutions is the deep-cycle battery, which are resistant to shock and vibration, can be kept in storage for long periods of time, and are usually fully sealed and maintenance free. Whatever power equipment you choose, it’s important to store it carefully – away from where it could be damaged by water, and away from extreme temperatures. The better you store your equipment, the more holidays it’ll see you through!